When you buy a Smartphone, you take a note of a few things in general, i.e., the brand, its specifications, its features and your budget. You would like to have a Smartphone that comes with great features and fits your budget too. Motorola has launched its all new budget Smartphone this Tuesday and it’s all set to woo the market. Where expensive phones like Apple or Samsung are not afforded by common people, majority of buyers prefer to buy budget Smartphone. Motorola has a different concept. Being priced at INR 7000, it is flattering in the market. The eye-catching low priced device is set to take over the market with its features and specifications. It’s a highly polished device and the best option for low-budget buyers. It is available only via online store flipcart. It is perfectly made for a human hand. On the right edge of the device, there is a power button which is a smart option. With no top button, Moto E has a volume rocker button below that owes a solid metallic coating and a solid but shallow clicking action. With a 5 megapixel camera, the phone is able to capture impressive photos, in terms of both color and details. However, there is an absence of front camera but the phone’s camera settings offers limited settings to customize photos. Also, it allows you to trim and edit videos in slow motion on the device. The phone has a 4.3-inch display (960 x 549 pixels) with a density of 256ppi and is comfortable in hands. With a thickness of 12.3 mm, we cannot consider it as a fat phone rather it is designed ergonomically with a curved back which makes it look less thick. It has a matt rubber coating at top which makes it sweat free. The back cover is not prone to get smudges. 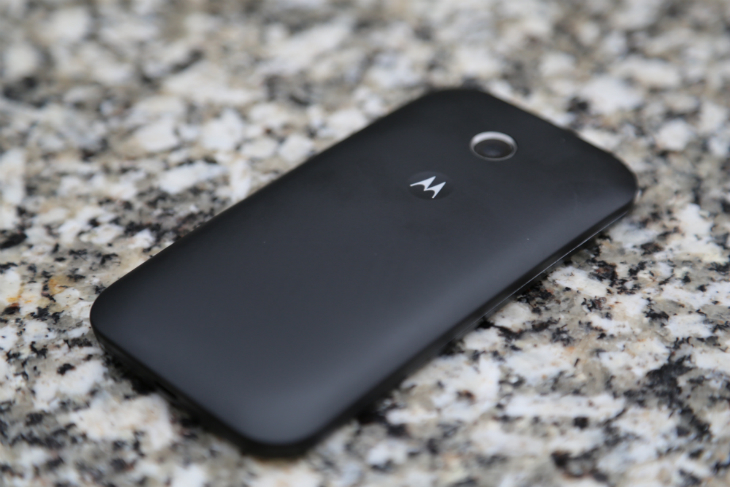 Moto E has got a responsive touch with great viewing angle and is smooth to navigate easily. Even while having the Gorilla Glass 3 protection, Moto E is constructed from plastic. There is a small rim around the glass which is made from glossy polycarbonate. Whereas the back cover is coated with a soft material making it great to touch. The phone has a speaker in front that makes loud music sound clearly. The device is available in standard black and white colors with a changeable back panel. The phone has three slots- two for SIMs and one for microSD card that supports up to 32GB external memory and the internal memory being 4 GB out of which 2.2GB is accessible. Users cannot take out the battery. It runs on a dual-core Qualcomm Snapdragon 200 with Adreno 302 400MHz single-core GPU. 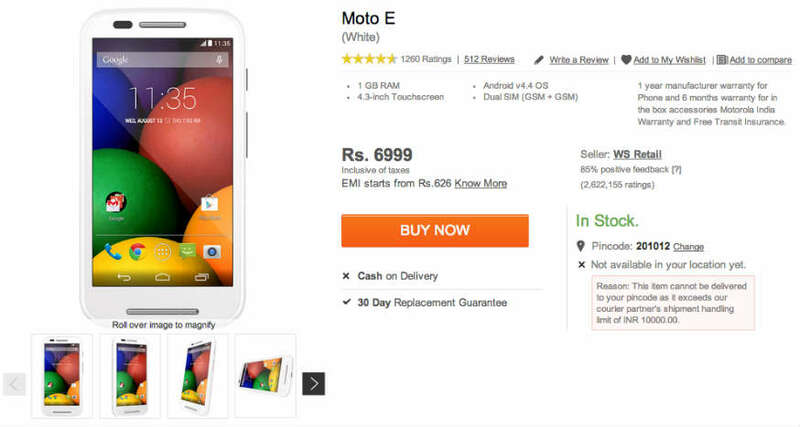 It has 1GB of RAM and runs the latest version of Android 4.4.2 KitKat and comes with a guaranteed software update. There is an app drawer at the bottom of the screen, it toggles quickly and available from the notifications screen. With up to 24 hours of battery life, this phone is a steal and is highly efficient budget Smartphone.